This week has been quite busy, Mummy decided the ponies all needed clipping, she doesn’t like clipping she says it gives her hairy eyeballs but it’s too expensive to get someone in once a month to do the job. Mummy says she’s rubbish at clipping and hasn’t got an artistic bone in her body, but this year for the very first time she managed to clip hearts into Rowan’s rump and I think they look awesome. My sister Saskia had her birthday this week too, she was 13. She got lots of orange things as orange is her absolute favourite colour. Mummy says it’s quite useful as we can see what she’s up to. The best day of the week for me was Sunday, I spent all day at the CLCH Hunter trials at Iping, I did the 70cm pairs with my big sister Anna, the jumps were pretty big but Rowan jumped all of them, Anna had some braking issues with Bob so we didn’t get any frillies, but we enjoyed our round and learnt lots. Saskia jumped round the 90cm pairs with her friend Issy, they came 2nd!!! Later, they both jumped round the 100cm which was HUGE, both had a stop but they were the youngest on the smallest ponies, so were both very happy with their ponies. 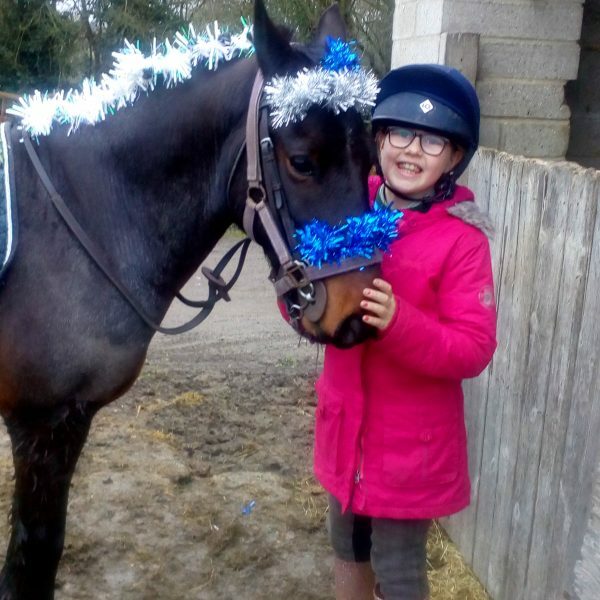 When I had finished my round I stayed with mummy and my friends Emily and Scarlett and we rode round in the back of a pickup truck giving the jump judges tea, coffee, water and cake. Mummy said she had never been more popular. Lucky I managed to stop Scarlett launching a water bottle at an unsuspecting jump judge or we would have been most unpopular! I’m wondering if I’m the only child who actually gets up earlier at the weekend than on a school day, on Saturday I was up at 04:30 to go Autumn hunting, mummy went to the wrong parking place then couldn’t reverse the lorry. When I turned the light on she realised she had been putting it in 1st gear not reverse, she blames it on the early morning.